Dr. Vayu Naidu is a Storyteller and Novelist. She is Royal Literary Fund Fellow. 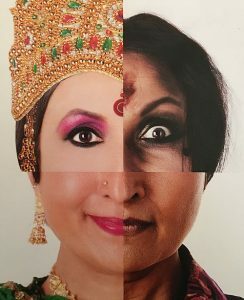 Vayu Naidu was awarded Europe’s first Phd in oral traditions of Storytelling from South Asia at The University of Leeds, The Workshop Theatre. While exploring Rasa, establishing a bridge of emotive intelligence for performers of Storytelling, she set out as a practitioner using Indic and African story as a metaphor for contemporary performance. She installed the first Storytelling Programme at the University of Kent with an AHRC postdoctoral Fellowship creating discourse and methodology in Intercultural performance with oral narratives. Her work with migration and mental health, Learning for young adults with behavioural disorder, multicultural literacy in Primary and Secondary Education, with victims of Domestic violence and in Prisons won her the Arts and Humanities Faculty Teaching award for Training and creating Apprenticeships. Her creative and political work in diversity won her Arts Council England Revenue Funding (2004-2011) to establish Vayu Naidu Storytelling Theatre Company Videos of youtube Vayu Naidu company a Charity, touring nationally and internationally with new works in World Music, Jazz, Contemporary dance, Bharata Natyam, Kathak, and African Caribbean Carnival with world orchestras and British Composers. Her work Future Perfect with Birmingham Contemporary Music Group and composer Judith Weir CBE toured with the British Council across England and India. She was a Senior Lecturer at The University of Kent. In 2013 she was appointed as the first Sage-in-Residence at Eton College, working in partnership with diverse Independent schools in relooking at the teaching of epics as Literature from world cultures and their significance in an an age of celebrity.